The NBA recognized several leaders for their outstanding work in the legal field and within their communities. Sixteen awards were presented to deserving members at the annual awards gala by past president Daryl Parks, Esq. 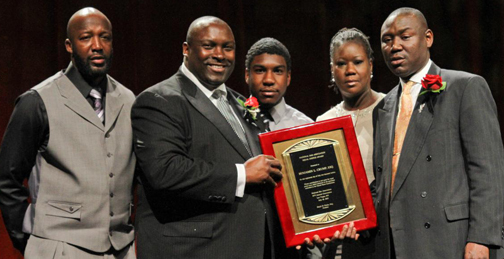 The recipients included Benjamin Crump, Esq; Linnes Finney, Jr., Esq. ; D. Peter Herbert, Esq. (O.B.E. ); John W. Boyd, Jr., Esq. ; Greg Francis, Esq. and Toyota. Other award recipients included The Minority Corporate Counsel Association (MCCA), VAULT, Juliette Pryor, Esq. and Laurie N. Robinson, Esq., who were all presented with the 2012 Pinnacle Award. In addition, the National Bar teamed with Impact to recognize the Nation’s Best Advocates: Top 40 Lawyers Under 40. The recipients of the Nation's Best Advocate of the Year, Excellence in Leadership, Service, Activism, and Innovation Awards were also presented. 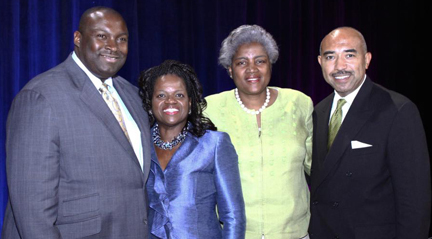 The event welcomed several special guests including panelists Bar­bara Arnwine (Law­y­ers’ Com­mit­tee for Civil Rights Under Law), Donna Bra­zile (Democratic National Com­mit­tee) and Gary Flowers (Black Leader­ship Forum). The three political advocates led the Presidential Showcase Forum on voter empowerment and election protection. High-profile case attorneys Benjamin Crump, Esq. and President Daryl Parks, Esq. 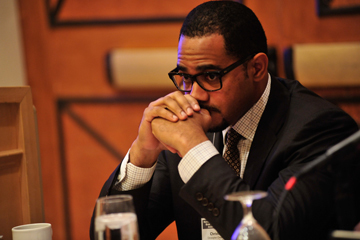 (attorneys for Trayvon Martin’s family) along with Chris Chestnut, Esq. (attorney for Robert Champion’s family in the FAMU hazing case) were featured speakers for the “Update from the Experts” panel and offered details on their respective cases. The parents of Trayvon Martin, Sybrina Fulton and Tracy Martin, were in attendance and shared a few words of thanks to the NBA. The Lawyers’ Committee also honored the parents for their strength and courageous spirit. The convention members had a chance to go into the community for two of their events including the Young Lawyers Pro-Bono Clinic where they offered free legal advice and answered questions for Las Vegas community residents at First A.M.E. Church. The 6th Annual Linnes Finney, Jr. NBA Youth Day welcomed teens ages 13-18 at the Boyd School of Law-UNLV. The daylong program provided Las Vegas students with a chance to learn about careers in the legal profession. In addition, 12 teens from around the country competed for national titles and $5,000 in the Dr. Martin L. King, Jr. Drum Major for Justice Advocacy Competition. More than $25,000 was awarded at the national competition. John Page, Esq. 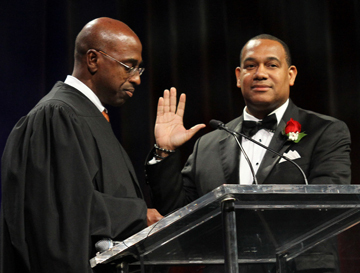 was sworn in as the new NBA president, taking over the leadership position for Daryl Parks, Esq. The 88th Annual Convention is scheduled for July 27-August 1, 2013 at the Fontainebleau Miami Beach Hotel in Miami, Florida.